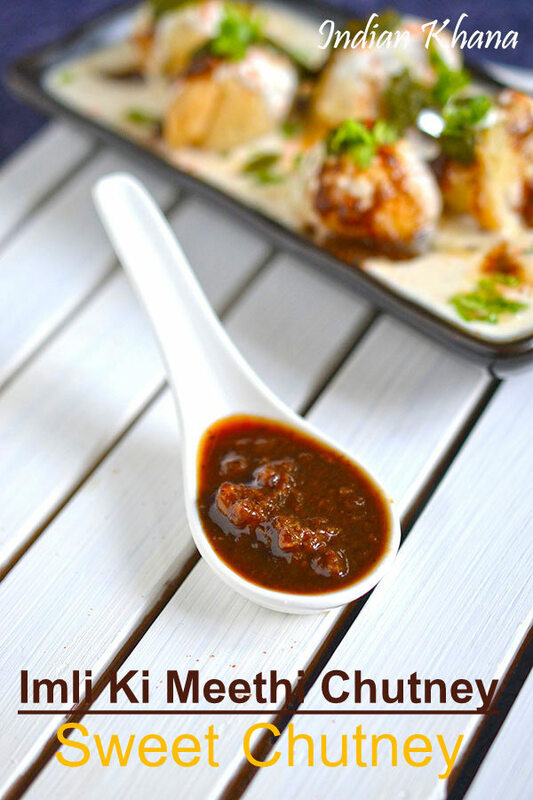 Imli Ki Meethi Chutney, Sweet Chutney or Sweet Chaat Chutney, tamarind sweet chutney is easy chaat chutney made with tamarind, raisins, jaggery as main ingredients. 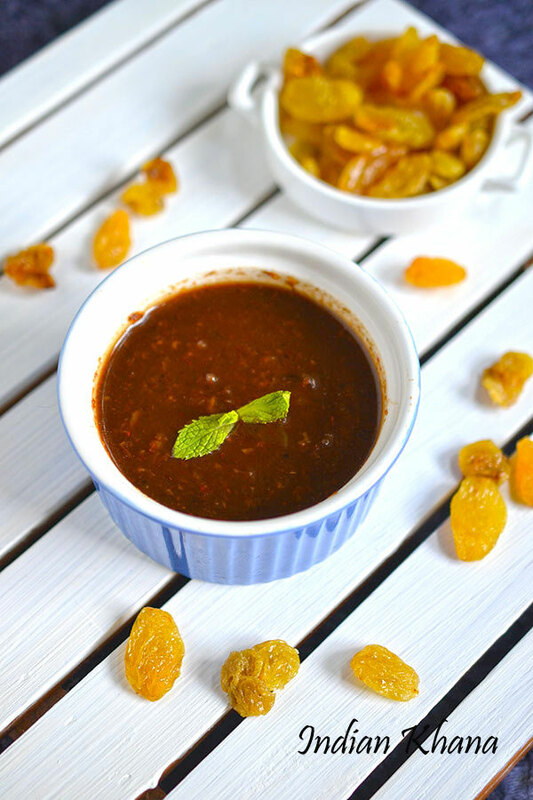 I have already posted sweet chutney recipe in which is made from tamarind and dates and in this sweet chutney no dates are used. 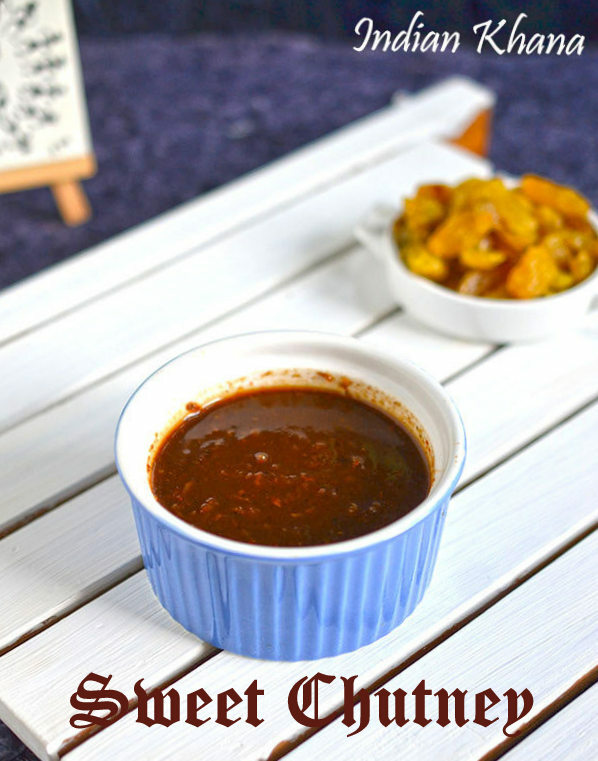 If I run out of dates stock (which is like rare( and need to prepare some sweet chutney then this is recipe I follow, it's easy and quick and makes real good chaat sweet chutney. With just few ingredients we can make this chutney and it can be store in frigde for month or even more but mine never stays more than a month any time. Also I always make sweet chutney quick thick and later add water if needs to dilute it, you can keep the chutney consistency as per your need it works anyway wonderful well with all chaat recipes. Recently I made dahi bhalla for my Co-SIL while they were here on holiday so I made this sweet chutney, you can serve this chutney with paratha, toast, pakoda apart from using in chaats. Raisins adds wonderful texture and flavor to this chutney along with cumin powder, rock salt. 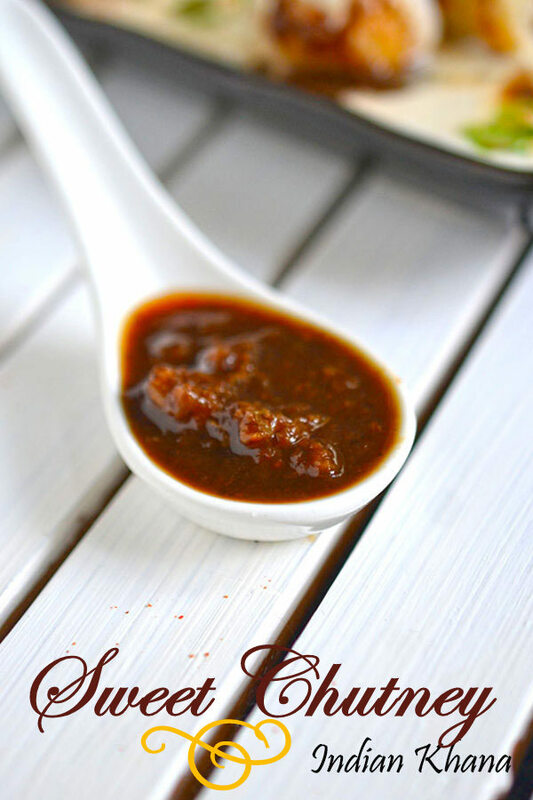 Sweet Chutney or Imli meethi chutney is made with tamarind, jaggery, raisins, makes perfect chutney for chaats. 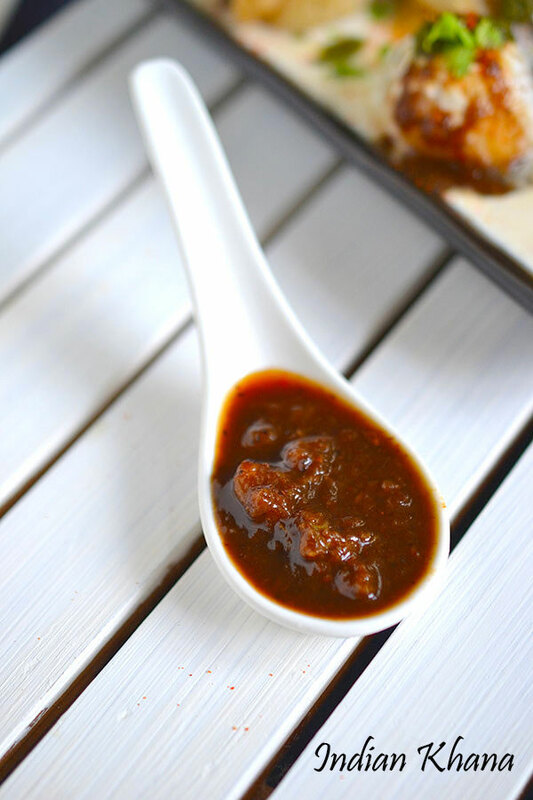 Cook extracted tamarind juice in a pan or wok until it starts to boil, now add jaggery, raisins paste, red chili powder, cumin powder, rock salt and mix well. Cook in medium flame until jaggery dissolves and chutney becomes thick with stirring regularly. Add cardamom powder, stir well and off flame. Store in air tight container and it stays good upto 1 month if kept in refrigerator and always used clean spoon every time. You can add sugar instead of jaggery. You can replace rock salt with chaat masala. I normally make my chutney thick like you see in the pictures and store. If I need to dilute I just add little water every time I use the chutney. Delicious sweet chutney perfect with any chaat, dahi bhalla or even sandwich.